Haitian pastors provide music during the Ethnic Pastors’ Gathering recently in Atlanta, Ga.
Christa Brown, missions mobilizer at Encompass World Partners, has reported on the recent gathering of Grace Brethren ethnic pastors, which was held January 8-11, 2013, in Atlanta, Ga.
At noon, about 30 ethnic leaders ministering across the U.S. and Canada gathered together in Atlanta, Ga., to kick off the 4th annual FGBC ethnic leaders’ conference. The group shared lunch together and introduced new participants. Afterward, the group gathered in the Encompass office as Dave Guiles, executive director, presented on Global Trends and Major Challenges Facing the Evangelical Church. 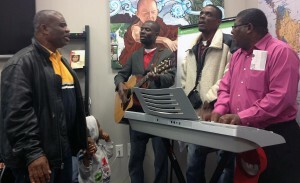 After dinner, the gathering enjoyed a time of worship together. Many shared powerful testimonies of how God transformed their lives, calling them out of the darkness into the kingdom of light and is now working among them through various ministries. Dave Guiles, executive director of Encompass World Partners, welcomes the pastors to Atlanta. The morning started with worship together followed by a devotional brought by Kevin Ong. Kevin shared with the group some stories of how God is bringing people from all over the world to the International House he runs in San Francisco. Doors and hearts are being opened to the gospel among the nations. For the following four hours, Dr. Tom Stallter of Grace College and Seminary provided further training in cross-cultural communication and ministry during the first of a two-part workshop. The later part of the day provided an opportunity for the group members to get to know each other better as various groups spread out around Atlanta observing the diversity and sights of the city. 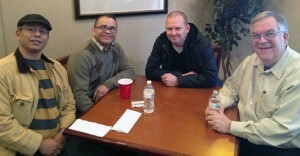 Getting acquainted at the Ethnic Pastors Conference in Atlanta. Another good morning was begun by worship in song and a devotional, this time provided by Haitian pastor, Dumont Cardichon. He reminded the group that no matter our situation, we are all winners and victorious in Christ. Dr. Stallter followed with part two of the valuable training workshop designed to become more aware of our own cultural tendencies and how to better understand and work with those from whom we are different. Everyone enjoyed some of Atlanta’s diverse ethnic cuisine together then joined Jay Bell (director of Internationals USA at Encompass World Partners) for a workshop on immigration. Jay led a practical and passionate discussion on the topic of immigration. It is evident God is bringing overwhelming opportunities to reach the nations. Particularly discussed was the challenge of illegal immigration as well as how the body of Christ should respond and interact. Meetings concluded today with one final time of worship and encouragement from the Word brought by Steve Galegor, who pastors an Albanian church in New Jersey. Jesús Muñoz challenged the group to put the vision God has given them into action. 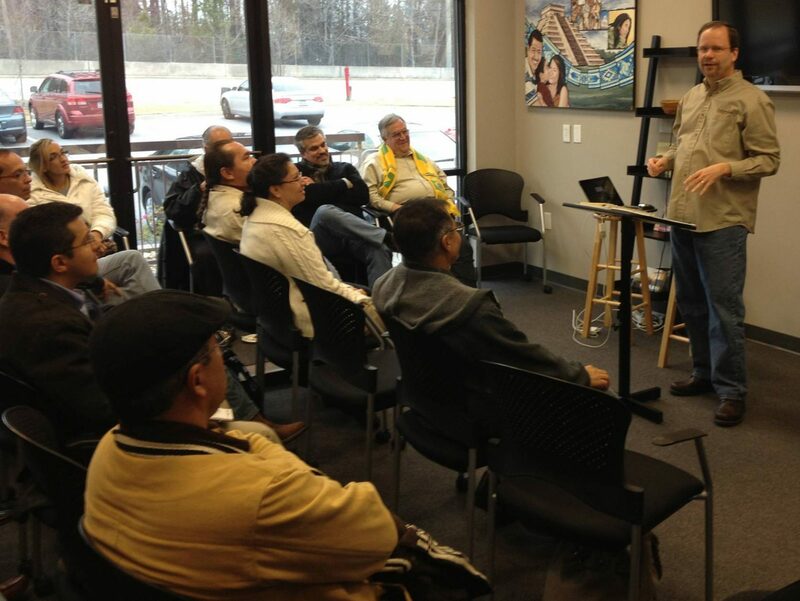 Finally, Dave Guiles joined the group, wrapping up their time together by sharing Encompass’ vision for ministry in Atlanta and national conference which will take place here this summer, 2013.